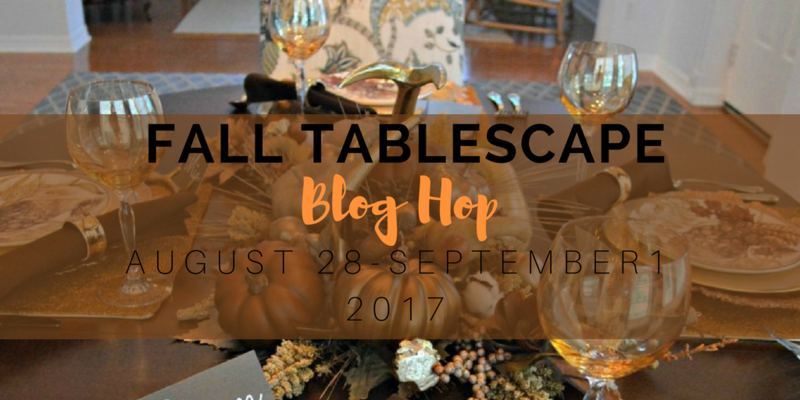 Welcome to the Fall Tablescape Blog Hop! 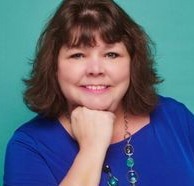 If you are visiting from Starfish Cottage, I am so happy you are here! A big thank you to Chloe from Celebrate and Decorate for hosting this fun Blog Hop. It is something I look forward to for weeks. Hopefully you have visited some of the other bloggers and will visit the rest throughout the week. You will definitely be inspired! If you have been here before, you know I love to set a beautiful table. Prior to my sister moving to Florida, I always hosted Thanksgiving and couldn’t wait to come up with new ideas for the tablescape-especially favors for the guests. My younger sister Joanne used to get so excited to see what I would put together. 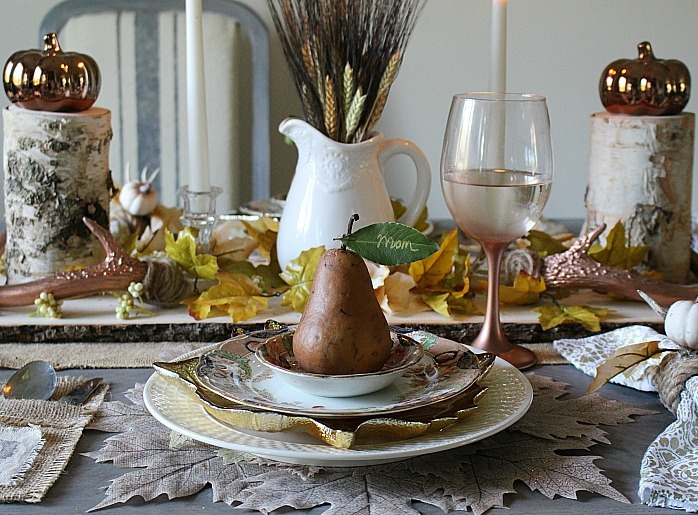 Though I no longer host Thanksgiving, it is still so fun to put together a beautiful tablescape for blog hops and fall home tours! Thanks for being here and I hope to inspire you with my Neutral Rustic Fall Tablescape. So grab a cup of your favorite pumpkin flavor beverage and let’s get to it! When planning a tablescape, I normally start with an inspiration piece. For this setting it was the gorgeous leaf placemats I found at Pier1 Imports. I loved that they were soft, muted fall colors and had hints of copper glitter in them. Once I had my inspiration piece, I decided on what dishes to use. I have a thrift store in town that sells dishes 4 for $1! No joke! It is a little scary though because they literally pile plates up on shelves and you have to sort through them. It is no easy task-especially for someone like me who tends to be a little clumsy. But it is so worth the effort. I love white china and found these simple ivory plates that I knew would be perfect with the antique china from my great, great grandmother. Isn’t the basketweave pattern great? Again 25 cents!! 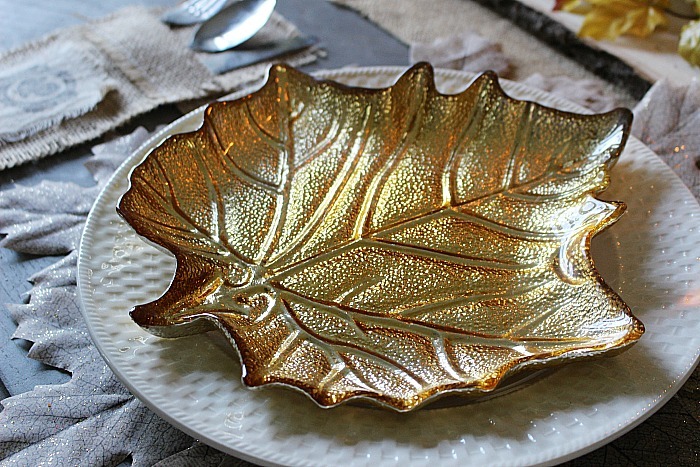 Next, I added these gorgeous metallic leaf plates and did a little happy dance! I am a bling girl all the way and this is like bling for your table! Mixing old and new is a great way to not only keep costs down, but also to add personal elements to your tablescape. My great, great grandmother’s antique china is my favorite to use at Thanksgiving not only because of the sentimental value, but also because of the fall colors and pattern. The rich cobalt blues and coppers in this antique china pop against the dinner plate and metallic leaf. I didn’t want anything to compete with the china, but wanted to have some kind of place card at each setting. In keeping with the rustic theme, I went with a neutral pear and added a bay leaf with gold lettering. It is simple but I think kind of elegant on the china. Next I used my DIY Napkin Rings for pretty gold and white linen napkins that I picked up on clearance at the home store. I just hot glued the pumpkin and leaves to the top of the rope napkin holder. I really wanted to include pretty copper stemmed wine glasses, but it just wasn’t in the budget. What is a crafter to do? 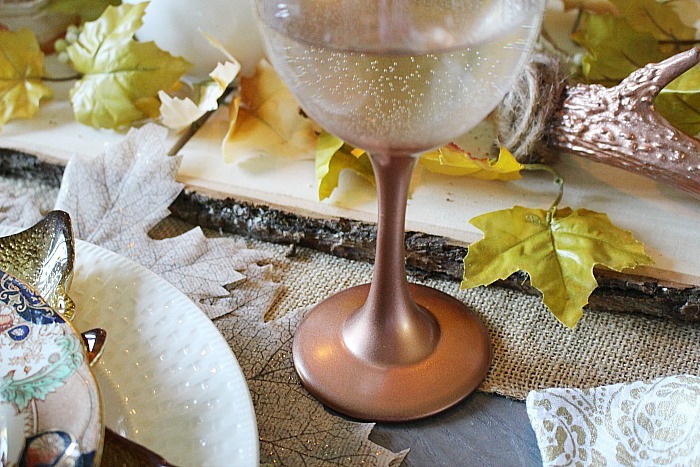 Simply take my favorite copper spray paint to the stems of Dollar Store Wine Glasses for an inexpensive, yet elegant look. They really pick up the copper tones in the dishes. The flatware was placed in the DIY Burlap Silverware Holder that I made a few years ago. For the centerpiece, I wanted to stick with the neutral, rustic theme and went with my favorite Walnut Hollow Wood Slice Planks . I use these for so many things. I will let you in on a secret-I painted the back side with chalkboard paint for another decor option. I use both sides of everything. It is a great way to mix things up and also saves on storage. 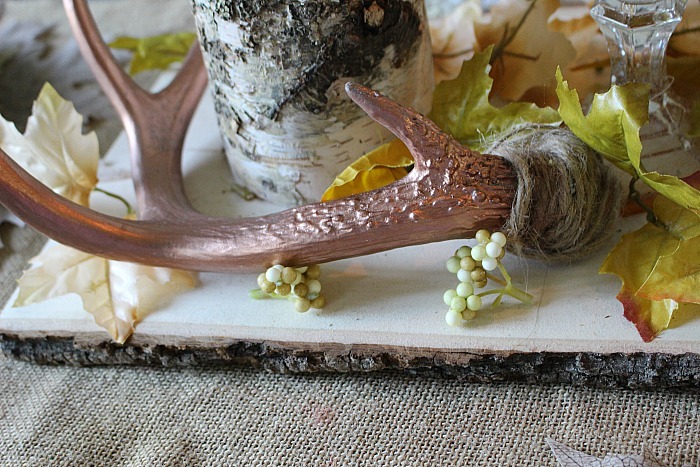 Antler sheds were also given a copper hue and are a nice addition to the rustic theme. An ironstone pitcher filled with wheat and some faux leaves compliment the rustic look of the wood slice planks, but are not overwhelming. My favorite addition are the gorgeous Walnut Hollow Rustic Birch Pillars . They are so versatile and I have so many ideas for these. For now, I placed copper ceramic Dollar Store pumpkins on top and just love them. 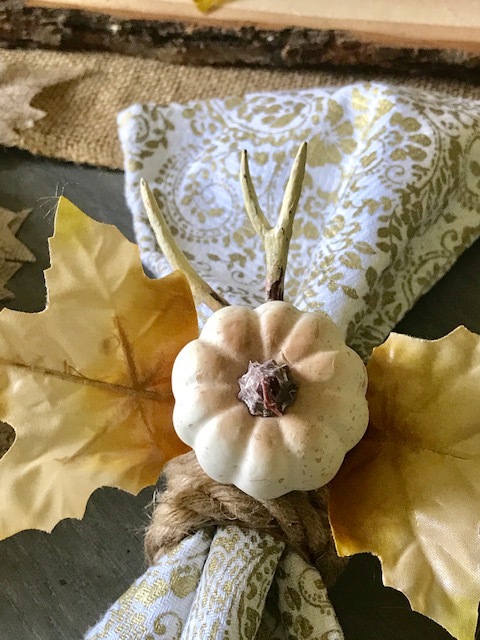 I hope you enjoyed this post Create A Neutral Rustic Fall Tablescape and are inspired to set a beautiful table for your family. It doesn’t take much time or money-simply use items from nature like pine cones and leaves. Have fun checking out all the other fall tablescapes. I’m off to Dining Delight to see her fall goodness! I love your copper accents Michelle…and I purchased a few of those copper pumpkins at the dollar store also. You gave me a great idea for another Fall tablescape. I like the softness of the placemats….what a great tablescape. Michelle, I am blown away by your creativity! Dollar store glasses trimmed with copper paint are so creative as well as the antler sheds. Those copper pumpkins I must look for, too. Your grandmother’s china is so pretty and looks great how you have styled it for fall. I believe it is the same pattern I used a few years ago in a tablescape. I will look and send you a link for fun. The pear is the pièce de rèsistance! Love how you added the bay leaf! Your rustic and glam table is lovely and has so much charm and layers of interest. Michelle, your table is so beautiful. You right, great minds think alike and your copper stem glasses are perfect. Your thrifted plates are perfect because you can use them in so many different ways and that price is crazy! The beautiful dishes on top look great! Happy Fall! 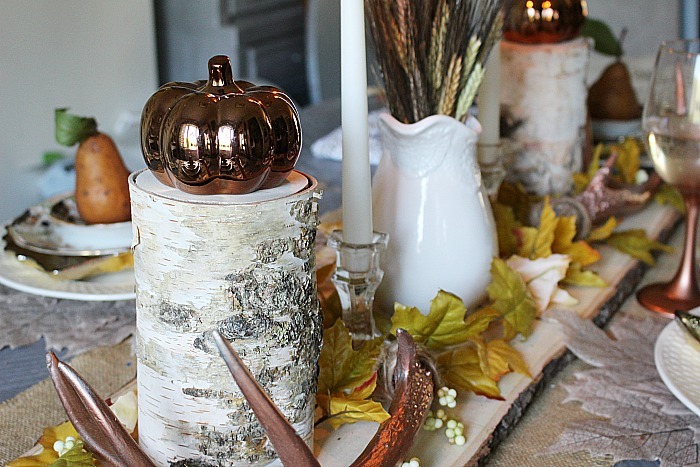 Michelle, love your creativity for this fall table. The copper sprayed goblets are awesome, great idea! The flatware burlap pockets are darling. What a deal on those plates. Love the pear with the name tag. I want to shop at that thrift store! Those plates are quite a score! Really love the rich tones of your table. The metallic accents pared with the rustic elements are the perfect match. I love the placemats! They are so unique. How pretty Michelle! I’m a bling girl also and if it goes out of style I’ll still use it. The thrift store plates were quite a steal. Combined with your treasured china and placemats they are a lovely focal point. The wood plank makes a nice base and I can think of so many things to use it for. Beautiful work and have a fun holiday weekend! Oh so soft and pretty and perfect for early fall! I love your contrast of textures and layers from the leafy placemats, tree bark candle holders, burlap and sparkling copper! 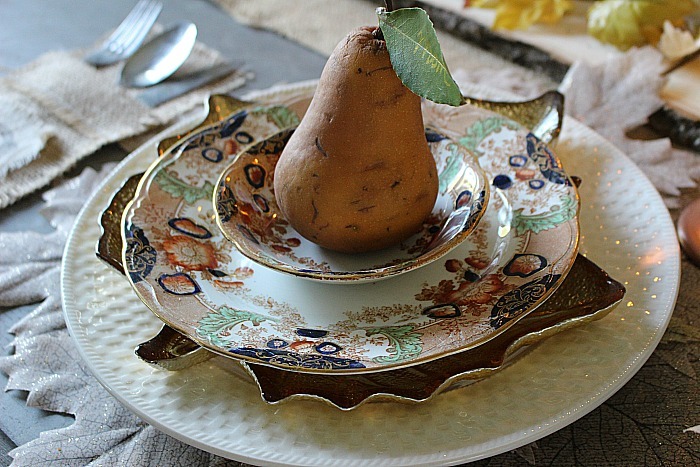 I love that you mixed your great grandmother’s heirloom dishes with new pieces too. Your creative side is shining through Michelle! I love your non traditional mix in the plate stack and all the fall elements you’ve incorporated. This has been such a great hop! Michelle, what a lovely table with so many fabulous details. Your great-grandmother’s china is perfect mixed with all the other elements. Spraying the dollar tree stems with copper is an idea I am going to try. The placemats were a great inspiration! You have been so kind in sharing everyone’s tablescapes on Instagram, thank you! Your layered plates are stunningly gorgeous and so elegant. 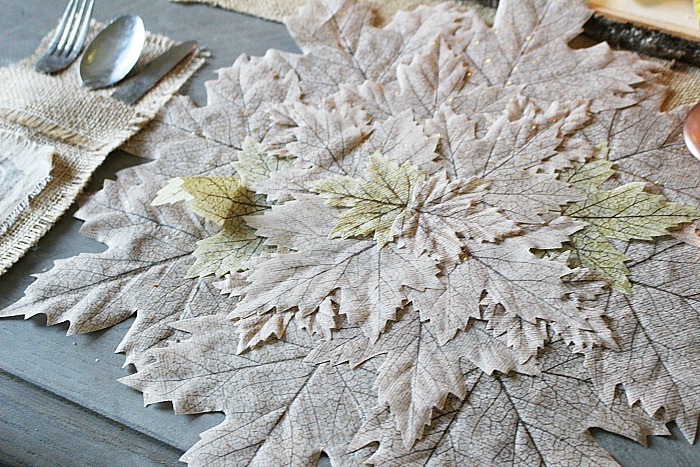 The leaf placemats are lovely, and your centerpiece is amazing. 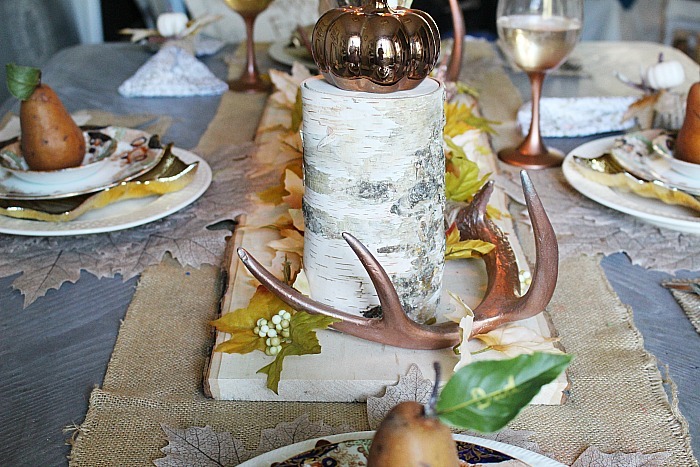 I love the feathers, antlers, birch, and metallic pumpkins. Truly spectacular! 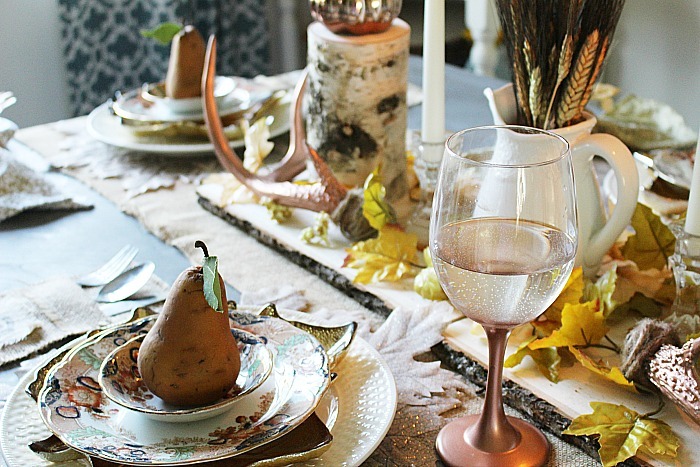 You’ve put together such a fantastic tablescape that looks perfect for your theme. 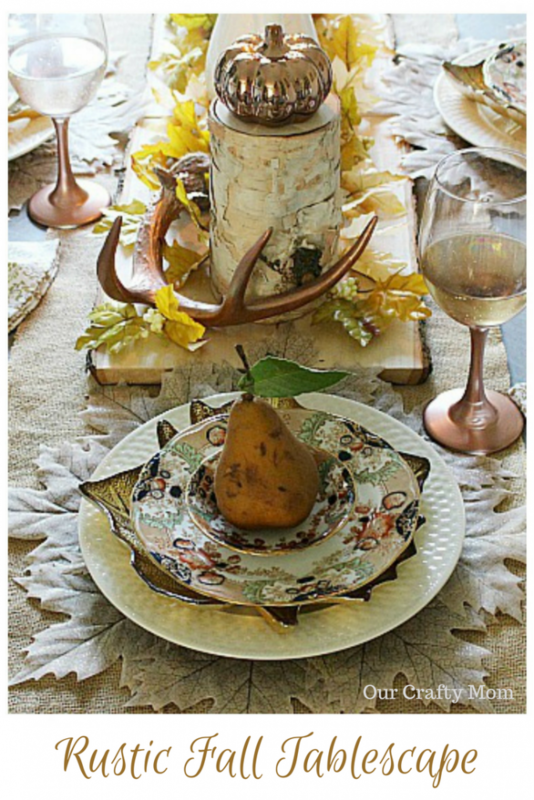 Love those copper pumpkins combined with the stemware and antlers. Those birch log pieces are fabulous and you are right, will come in so handy for decorating in the coming seasons. Great idea to paint one side of your planks with chalkboard paint – way more versatile – and I like the slight elevation they give your centerpiece items. I can’t believe that incredible price for plates at your TS – my shelves would be breaking with the amount I’d bring home! What a fantastic tablescape. I love that you found such beautiful plates and 25 cents is the best! Every inch of your table is filled with fabulous decor! Gorgeous! Leaf placemats are beautiful and your grandma plates enchantig and perfect for this time of the year. Boy did you find a bargain or two and turn it into something so beautiful! Loving all of your Fall touches to bits! What a stunning table! I love the dish stack that you did, those leaf plates are calling my name. Such gorgeous color and texture, and you know I adore the antlers. I absolutely LOVE your fall table. It is exquisite! What is the name and maker of your great grandmother’s china? It is gorgeous. This is such a beautiful Fall and Thanksgiving tablescape. I love the colors in the antique china plates. Stopping by from the #HomeMattersParty this week. Have a great weekend! 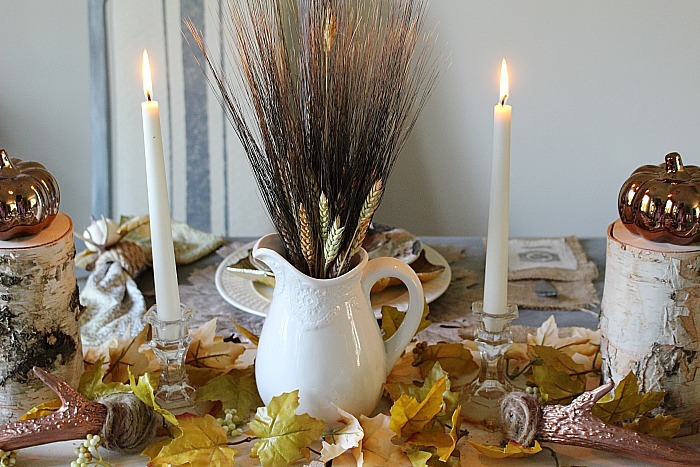 I just love your simple neutral fall table. So elegant and pretty! 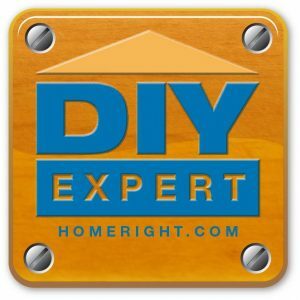 I like how you showed step by step how you layer your table…its been so fun visiting all the blogs this week and seeing all the different tables, thanks for sharing your talents! My favorite…..the plates, they are toooooo cool and what a great price! Oh Michelle, what a beautiful table! 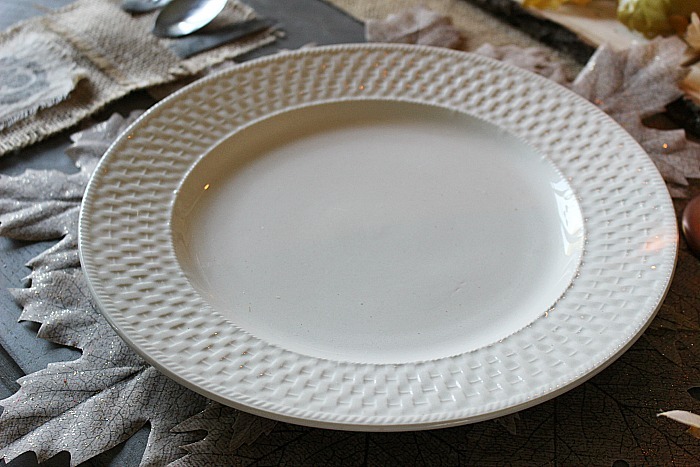 It is so elegant with the pattern on those plates, and it is almost a shame that those stunning placemats get covered up! 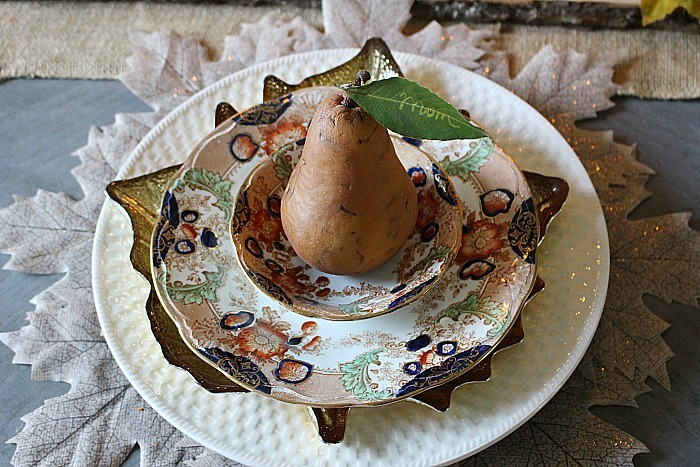 The pear place cards are perfect for your table! Thank you so much for being a part of the Fall blog hop! Michelle, you knocked this one out of the park! SO many ideas for a festive autumn get together I don’t even know where to start. First, I’m in LOVE with your grandmother’s china – I’m not normally a china girl, but it is SO beautiful and versatile! It’s so lovely that you have it! 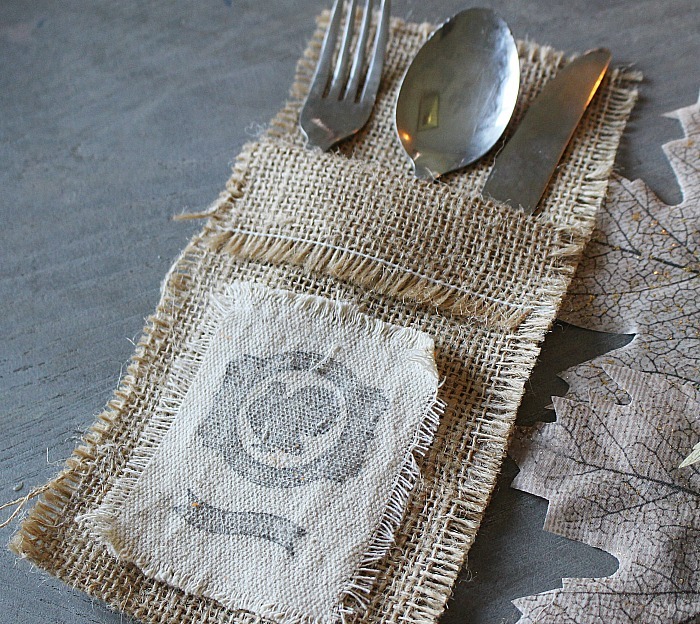 All of your DIY projects are right on the mark, too – love your silverware pouches! 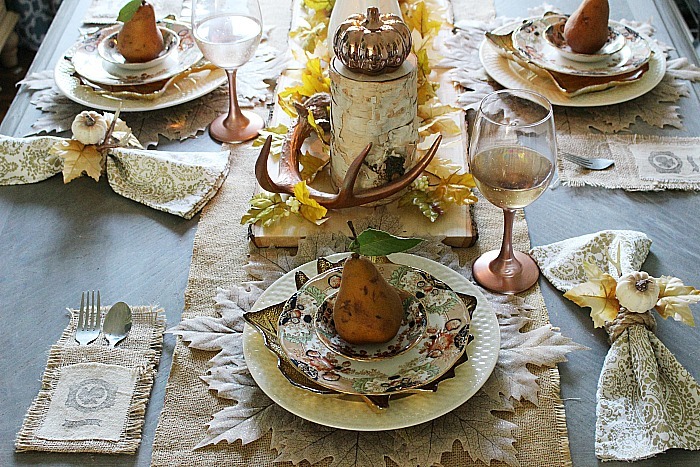 Beautiful table – given that you aren’t hosting Thanksgiving, does that mean you’d be free to set my table then? Love your table and creativity you used. 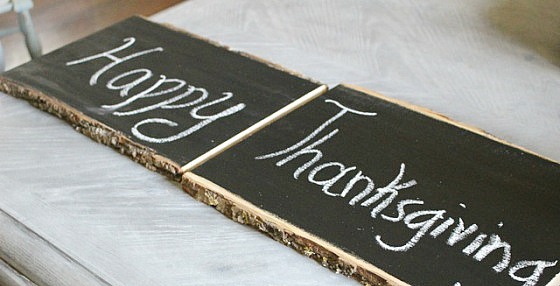 I like the chalkpaint signs and what to try something like that. I have a couple of planks! Your dishes are gorgeous too! Just a perfect creation for a fall dinner. Love the table settings! Those leaves underneath are one of my favorite features! Love it all! Such a pretty tablescape, Michelle! Thanks for sharing @ Vintage Charm! Very pretty! Neutral tables are a favorite of mine. Thanks for sharing at Home Sweet Home!